Downloadable copy available via iTunes. Of particular note, the background music is a local song called Panggayo, which Michael was kind enough to sing for me. 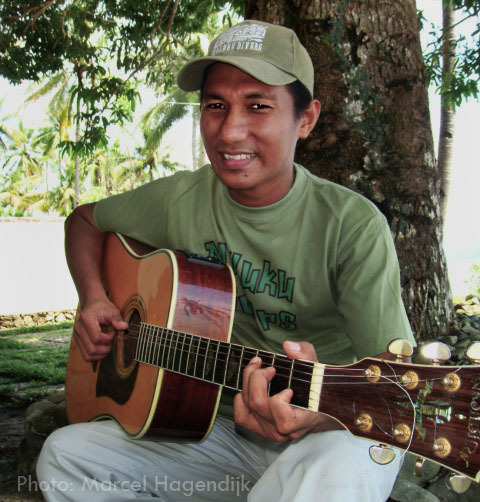 If you visit Ambon and dive with Maluku Divers, there's a good chance that Michael will be the guy who picks you up at the airport...so be sure to tease him tell him what a talented singer he is! He has a wonderful voice and is proficient with a number of instruments, including guitar. I'm really happy he agreed to help with the video, since finding appropriate music for a slideshow/ video is always difficult. Featuring local talent adds a nice touch to the finished product. Enjoy the video, and visit Ambon if you get the opportunity! Note: If you're interested in reading about the workflow I used to put this video together, I summarised the main points in this post.